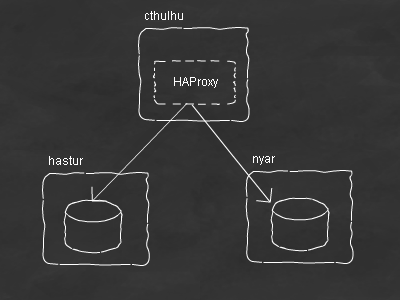 [root@cthulhu haproxy-1.4.10]# mysql -h 127.0.0.1 -u haproxy hoge -e "SELECT * FROM fuga"
Dec  4 18:46:20 cthulhu haproxy: Server mysql/nyar is DOWN, reason: Layer4 connection problem, info: "Connection refused", check duration: 4ms. 1 active and 0 backup servers left. 0 sessions active, 0 requeued, 0 remaining in queue. [root@cthulhu ~]# mysql -h 127.0.0.1 -u haproxy hoge -e "SELECT * FROM fuga"
Dec  4 18:48:59 cthulhu haproxy: Server mysql/nyar is UP, reason: Layer7 check passed, code: 0, info: "5.0.77", check duration: 227ms. 2 active and 0 backup servers online. 0 sessions requeued, 0 total in queue.